We have been provided with the exclusive first trailer for the upcoming thriller House Shark, which is slated to debut sometime in the spring of 2018. Billed as "Jaws in a house," this new shark thriller takes the genre to a whole other level. Instead of a deadly shark lurking underwater to find its prey in the ocean, this deadly shark has found its way into a seemingly normal suburban house. 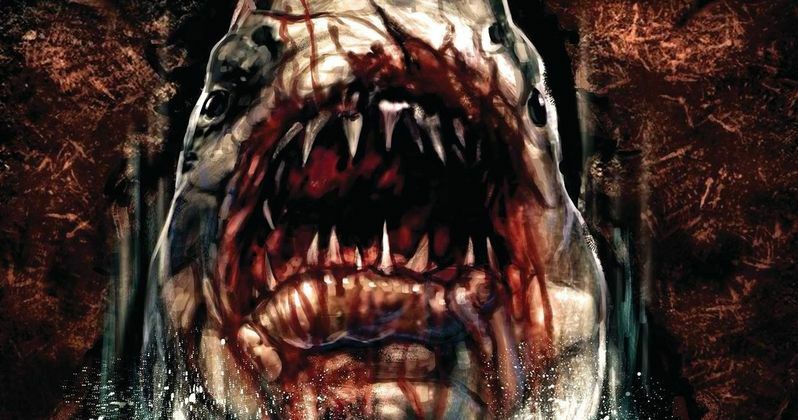 When Frank (Trey Harrison) finds his happy home under attack by a dangerous but largely unknown breed of shark, he's enlists the aid of the world's only House Shark Expert, Zachary (Michael Merchant), and a grizzled former real estate agent, Abraham (Wes Reid), to embark on a desperate quest to destroy the beast and claim back his life. Just when you thought it was safe to go home, this House Shark strikes, leaving bloody chaos in its wake. The trailer from SRS Cinema reveals that House Shark will be released in the spring of 2018, although a specific release date has not been given yet. House Shark will be released through Ron Bonk's company SRS Cinema, which he founded in Central New York. It's possible that this film could be an attempt to spoof the lucrative Sharknado franchise, which continues next month with Sharknado 5 on Syfy. The premise of House Shark is just as comically ludicrous as a tornado filled with sharks, that somehow finds its way across the country, and now, around the entire globe. Of course, there is no connection between Sharknado and House Shark, but the latter could turn out to be a cult classic, just like the former. After the release of this trailer, it's possible we could get more word on when House Shark will be released, and if it will be heading to VOD/Digital HD formats or getting a theatrical release. Along with this trailer, we also have the first House Shark poster, and five new photos from this upcoming thriller. Take a look at the House Shark trailer, poster and photos, as we await more news on this upcoming shark movie.